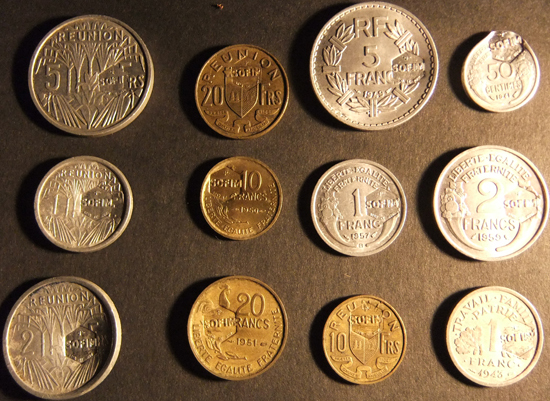 Hilmar J. Herzberg (email: congo-hilmar@gmx.de), numismatist living in Madagascar, just reported these nice countermarked tokens, as having circulated in Juan de Nova Island in the 1950s. 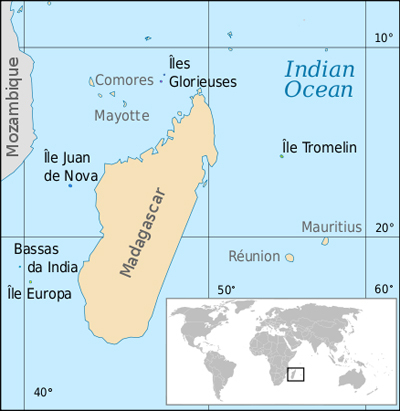 Juan de Nova Island lies in the Mozambique Channel, between Madagascar and Mozambique. It is part of the French Southern and Antarctic Lands. It is also considered part of the Scattered Islands in the Indian Ocean, which also include Bassas da India, Europa Island, Glorioso Islands and Tromelin Island. Named after a famous 15th century Spanish navigator and explorer, the island has been a French possession since 1897. Juan de Nova Island is a wildlife sanctuary for seabirds and sea turtles. It has been exploited for its guano and phosphate. 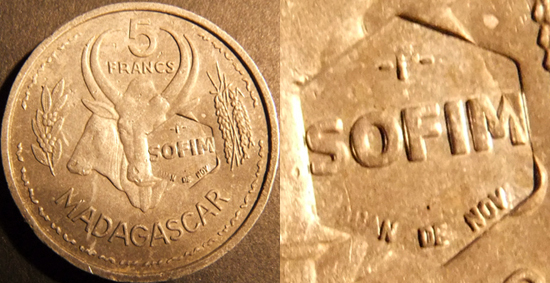 These tokens were countermarked probably in the mid-1950s from the SOFIM (Societe Francaise des Iles Malgaches) operating phosphate (guano) mines on the island from 1900 to 1968, when all economic activities ended. The six-edged seal of 8.50 mm bears the companies name in the center, the islands name on the bottom and a "P" on top, probably standing for "phosphate". 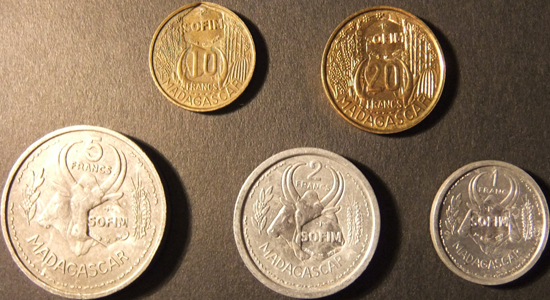 The number of tokens issued must have been rather limited, because only a few workers from Seychelles, Mauritius and Comoros were employed to mine the guano found on this flat island. Further research is under way. I WISH TO GET THOSE COINS.